GOLD MEDAL AT NATIONALS FOR 15U GIRLS MIGHTY NINJAS!!! They did it!!! 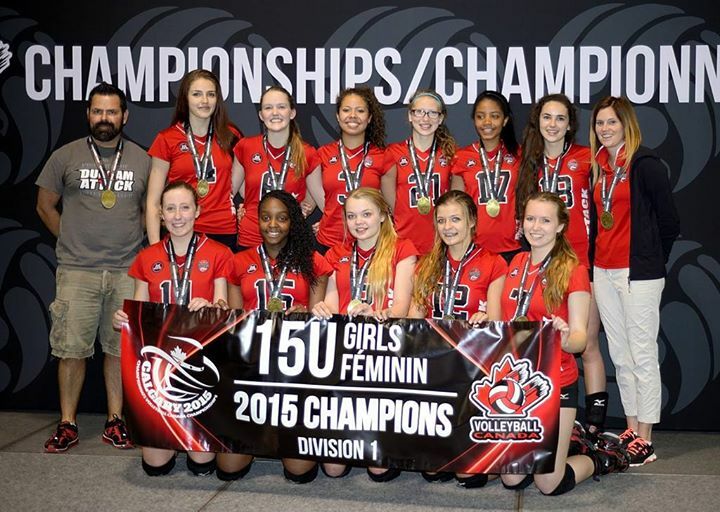 It was an ecstatic moment Saturday afternoon in Calgary as the 15U Girls Black Mighty Ninjas triumphed in a breathtaking 15-13 3rd set win over Ontario Gold Medallists Aurora Storm Typhoon! What a thrilling game – and day!!! The girls were on a mission from the start, showing the country the best of their superb skills and teamwork, winning all but one game over the 3 days. Saturday – win or go home day – the pressure was high but the girls were smiling and in their groove, and proved how strong they have become by pulling themselves quickly out of any moments of losing focus and never letting their opponents get a big enough lead to gain the upper hand. The girls could never relax – most matches were a challenge, but the Ninjas seized every opportunity for a fight, and their momentum and confidence rocketed in key wins over rivals Scarborough Titans Tektonics (in 2 sets 25-21, 25-21) and, in the critical quarter finals, over the strong Halton Hurricanes, battling point-for-point all the way and overcoming some questionable referee calls, pulling ahead at the end of the first 2 sets 27-25, 25-20. In the Semi-finals, the Ninjas faced the Bisons, the #1 ranked team from Manitoba, who gave it a good fight but could not overcome the Ninjas’ determination, advancing the Ninjas to the Gold medal match! In a re-match of the Ontario Provincial Championship Gold Medal Match, the Ninjas faced Storm Typhoon, and it looked like it was going to be a daunting fight as Storm took the first set 25-22. The Ninjas hung onto their positive attitude and determination though, and the second set was a completely different story once they found “their game”, surging ahead fiercely leaving Storm in the dust 25-14, giving them a 3rd set and a great shot at winning Gold! The 3rd was very tight – Storm pulled ahead a few points at the start, but the Ninjas were not conceding, and fought back hard to regain the lead and finally the win in a heart-stopping finish 15-13!!! Players, coaches and parents alike were ecstatic!!! To top the euphoria of the win, the Ninjas were so thrilled to have team members Kate Van Camp and Georgi Williams named as Tournament All Stars, and Meagan Reddon as the Tournament MVP!!! Way to go girls – what an awesome honour! Your team family and all of DA are so proud of you!!! Thanks for all the hard work, dedication and support by Coaches Kevin Hellyer and Kristi Moore, and Parent Rep extraordinaire Rose Hassall, and from all whose efforts contributed to this experience and achievement of a lifetime! !